The Elenco Line Tracking Mouse is an electronic soldering kit for building a small robotic mouse. 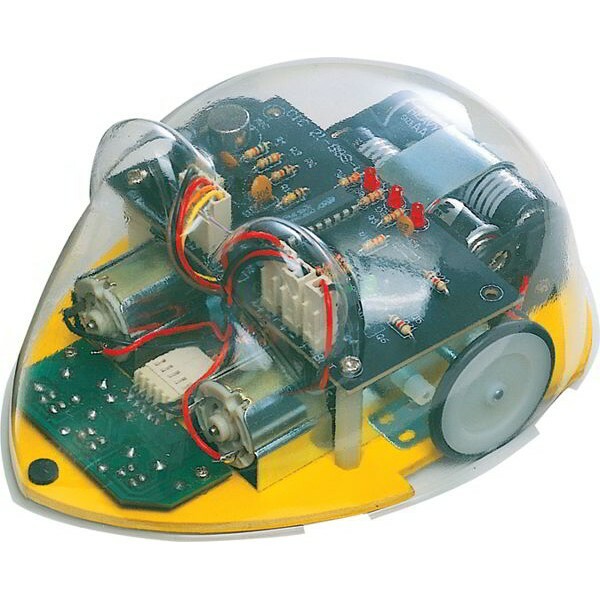 This is a great kit for soldering together a small robot. The assembly process is very straight forward and the tiny robot mouse does not require any programming. The transparent mouse body shows off your soldering skills nicely. This mouse is an excellent line follower. The robot uses a set of three IR Infrared refection sensors to see the line being followed. A black line on a white surface will absorb more of the invisible infrared light allowing the reflective sensors to detect the line. There are three LED indicators to show what the robot is seeing and two to show the state of the motors. The robot mouse can be started and stopped by clapping or tapping its body. The mouse is powered by four AA batteries, which are not included. This kit requires basic soldering skills.